Welcome home to 843 Eagle, a fully remodeled from top to bottom charming home! 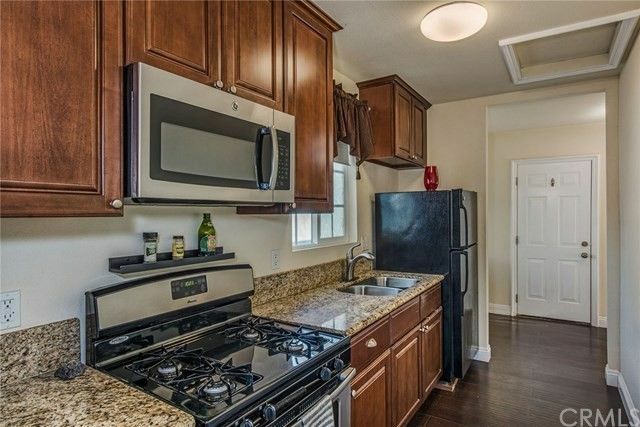 Complete remodel was completed in 2013 on this home and it has it all, newer Maple Kitchen cabinets with granite counter tops and newer stainless steel appliances. Newer Rich dark wood floors throughout, newer fully remodeled bathroom, newer custom window treatments, newer doors, newer dual pane windows, newer paint inside and out, newer crown molding, newer baseboards and casings, newer sprinkler system, newer garage door, new yard and landscaping, newer wall heater, newer plumbing fixtures, newer light fixtures, newer electrical and the list goes on and on, this is definitely a must see home that will sell itself! Fruit trees and new sod complete the large backyard with gated parking spaces as well as the one car garage and laundry room too!